Find Better Ideas, Faster ® with a custom sweater trend report, our PRO Dashboard and 80+ categories of premium trend reports. Examining patterns, materials and fits of winter weather apparel, the Sweater Trend Report reveals the most attractive and functional sweaters in the fashion market. It finds the factors and patterns of appeal to specific consumer groups, covering items like casual sweaters, sports sweatshirts, knit sweaters and even cashmere cardigans. Looking at various apparel lines, the report narrows in on favored trends in necklines, fit and colors of sweaters for men and women. The crowd-sourced research in this report gives useful insights to clothing retailers, outerwear outfitters, winter sports brands and clothing designers. Through a focus on sweaters, this report will be of particular use for professionals who want to spot emerging trends in the fashion industry. 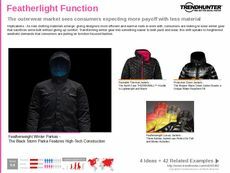 The Sweater Trend Report outlines what's popular in outerwear today and how this will shape warm fashion of the future. Fashion designers and retail buyers should take note.